Developing the design concept and exploring options and alternatives before tendering a project can pay dividends with any large–scale bulk material handling project. Southdowne Solutions Ltd can provide Front-End Engineering Design (FEED) studies for feasibility assessment and budgeting purposes and assist in preparation of CAPEX business cases. These studies can include terrestrial and aerial surveying and 3D modelling using photogrammetric techniques‚ space planning and layout drawings and development of project specifications and scope. 2D Key plans and equipment layout. Front–End Engineering Design (FEED)‚ is an engineering design approach used to thoroughly plan a project before quotations are sought. FEED studies are often an essential part of the CAPEX approval process and are necessary to develop a business case. They typically outline and analyse alternative methods of achieving the desired outcome. The FEED study helps to narrow the scope of the project to identify the best scenario. A feasibility report is generated following which a Post Feasibility Review is performed in which schedules‚ resource plans and estimates for the next phase are developed. The FEED study focuses on the technical requirements as well as rough investment cost for the project. It is used to establish a price for the execution phase of the project and evaluate potential risks. The FEED study can be divided into separate packages covering different portions of the project. The FEED package is used as the basis for bidding the Execution Phase Contracts and is used as the design basis. A good FEED study will reflect all of the client’s project–specific requirements and avoid significant changes during the execution phase. During the FEED phase there is a need for close communication between the Project Owners and Operators and the Engineering Contractors to work up the project–specific requirements. SSL can help liaise with the supply chain to develop the project specifications and work packages. Most sites‚ even greenfield ones‚ are constrained in some way and establishing the plant layout and developing key plans is often an essential first step for any bulk handling project. 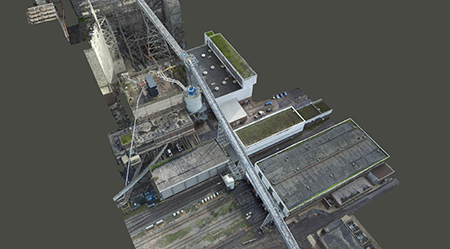 SSL are able to use photogrammetric aerial surveysto deliver 3D point–cloud models of large and complex survey areas. Lazer surveys are also possible but aerial photogrammetric surveying is much faster and any loss of accuracy is usually acceptable at this early concept phase. A 3D inventor model of the proposed process plant can then be incorporated into the point cloud model of the site‚ quickly producing a composite model of even the most complex brownfield sites. Once completed this model becomes an essential tool for optimising the layout and investigating the various options. It can then be used to develop procurement specifications and to develop the detailed design.